WASHINGTON – Key lawmakers said late Monday that they had reached a tentative agreement over immigration rules and funding for border barriers, a deal that if signed by President Donald Trump would avert another government shutdown set to start at week's end. White House officials did not have an immediate comment on the preliminary deal, which would fall far short of Trump's demands for funding to build more than 200 miles of wall along the U.S.-Mexico border. And while congressional negotiators said they were hopeful Trump would sign off on the deal, they said they had not been given assurances. The breakthrough in Congress came after a slog of meetings between top negotiators in the House and Senate. The deal is still being vetted with their colleagues, but top lawmakers expressed optimism that they had resolved major differences. 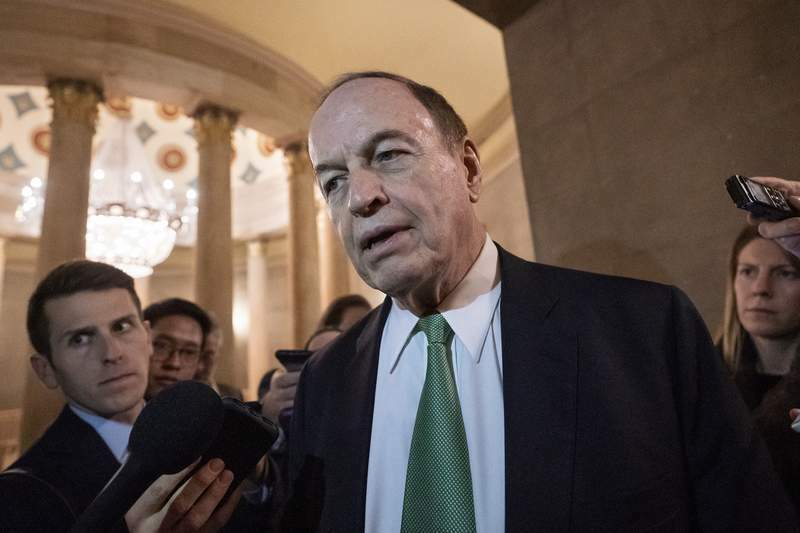 “The fact that it looked like there was going to be another shutdown imminently” brought renewed efforts Monday, Senate Appropriations Committee Chairman Richard Shelby, R-Ala., told reporters after announcing the deal. The framework would provide $1.375 billion for barriers along the border, including 55 miles of new fencing, with certain restrictions on the location, according to a congressional official familiar with the agreement. The official spoke on the condition of anonymity because the agreement had not been made public. Democrats backed away from their demand on tight limits on detention beds that Immigrations and Customs Enforcement could use to detain undocumented immigrants, pulling away from a push that led to a breakdown in talks over the weekend. Negotiators felt the deal would prove sufficient to fund all government operations through the end of September, potentially removing shutdown threats for the remainder of the fiscal year. House Appropriations Chairwoman Nita Lowey, D-Calif., who was in Monday's meetings, said she hoped the negotiators would have a finished product by Wednesday. She said that she ran the proposal by House Speaker Nancy Pelosi, D-Calif., and that the speaker signed off on it. Shelby, Lowey, Sen. Patrick Leahy, D-Vt., and Rep. Kay Granger, R-Texas, participated in the Monday meetings. The lawmakers are on a bipartisan conference committee charged with striking a border security deal. Negotiators had made steady progress but ran into trouble over the weekend. The White House had largely signaled to Republicans that it would soften its demand for $5.7 billion in wall money, convinced it could use other legal maneuvers to redirect existing funds. Instead, discussions bogged down over disagreements about how many undocumented immigrants could be detained at once. Republicans wanted flexibility in detention rules, arguing that they needed to be able to adjust to account for violent criminals and others. Democrats countered that the changes Republicans sought would give the White House almost limitless powers to detain as many people as they wanted. The unexpected dispute imperiled talks, spooking negotiators as they worried they were running out of time. Democrats signaled earlier in the day that they were more interested in cutting a deal than digging in as the Friday deadline neared, and they largely backed down by late Monday. Lawmakers had hoped to reach an agreement by midday Monday, a timeline they thought was sufficient to win House and Senate approval this week. “This provision would rightly be a total nonstarter for the White House,” McConnell said on the Senate floor. But Democrats have said the Republican descriptions inaccurately characterize their position. They said the White House's insistence on excluding people charged or convicted of crimes, even nonviolent drug offenses, would give the White House almost limitless power to detain people and make existing rules irrelevant. “How the government deals with ICE is a very important issue,” Lowey said. The Monday afternoon meeting came at a pivotal time. Trump traveled to El Paso, Texas, for a rally Monday evening, and he was expected to restate his case for tougher immigration rules. Republicans in Congress have tried to avoid Trump's hard-line rhetoric during negotiations, but his support is crucial for a final deal. The president on Monday attacked Democrats on Twitter, saying Democrats are trying to create new protections for undocumented immigrants with criminal records. “The Democrats do not want us to detain, or send back, criminal aliens! This is a brand new demand. Crazy!” he wrote.